I didn’t have much time at Salon QP this year, but here are five watches that caught my interest. Generally speaking, Salon QP is great as a way of introducing people in London to high-end watches, but the exhibitors mostly didn’t have any new products specifically for the show. Major brands such as IWC and Piaget were present with their latest products, which for the former include recent Pilot’s and Portugieser releases. Personally I felt that the major interest lay in the niche brands, which are constituting an area of growing importance in the watch sector. Armin Strom presented this watch in November 2016, and at Salon QP it was shown in a new edition with a white enamel dial. The Mirrored Force Resonance watch is a very unusual timepiece, with two regulators visible on the dial, oscillating in resonance. This is achieved by the terminal curves of the two balance springs being in contact through a complex shape that the brand calls the resonance clutch spring. The idea is that two regulators beating in resonance create a more precise assembly that is less affected by shock and position. The two counter-rotating seconds dials with triple-baton hands show the degree of identity of oscillation of the two springs, and they can be re-set to zero simultaneously using the pusher at 2 o’clock. The watch has a hand-wound movement with two mainspring barrels providing 48 hours power reserve. The balance springs run at 25,200 vibrations per hour. 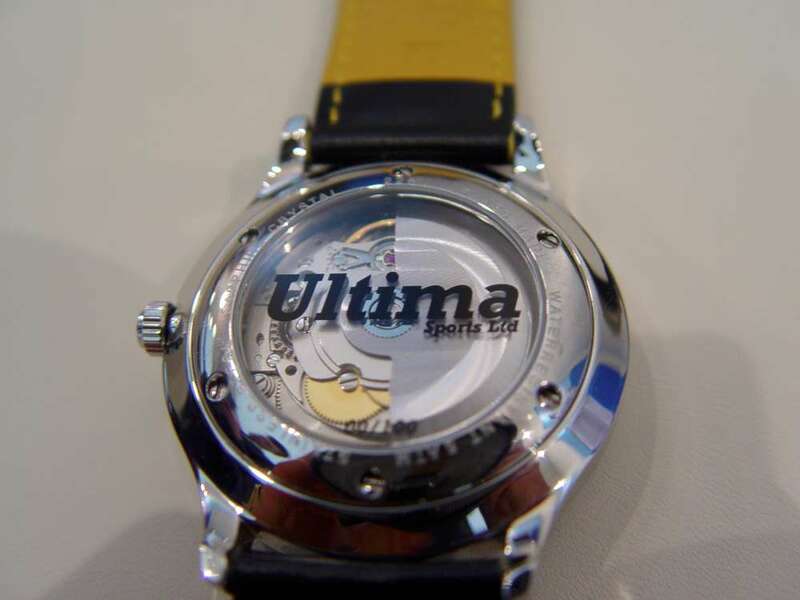 The case is 43 mm in diameter and 13 mm thick, water resistance 50 metres. 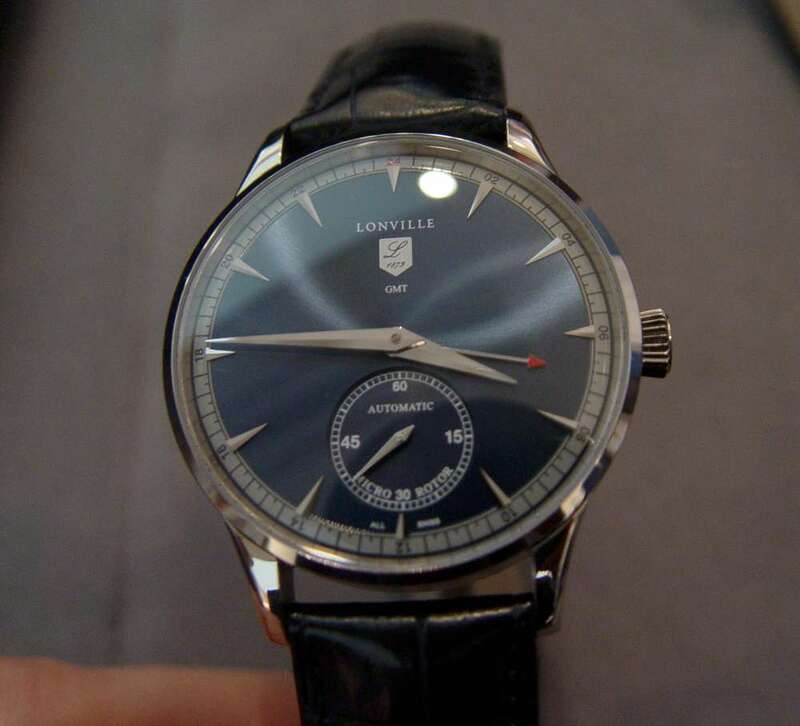 This version with the enamel dial costs 71,000 Swiss francs, in comparison with the 67,000 Swiss francs for the standard version. 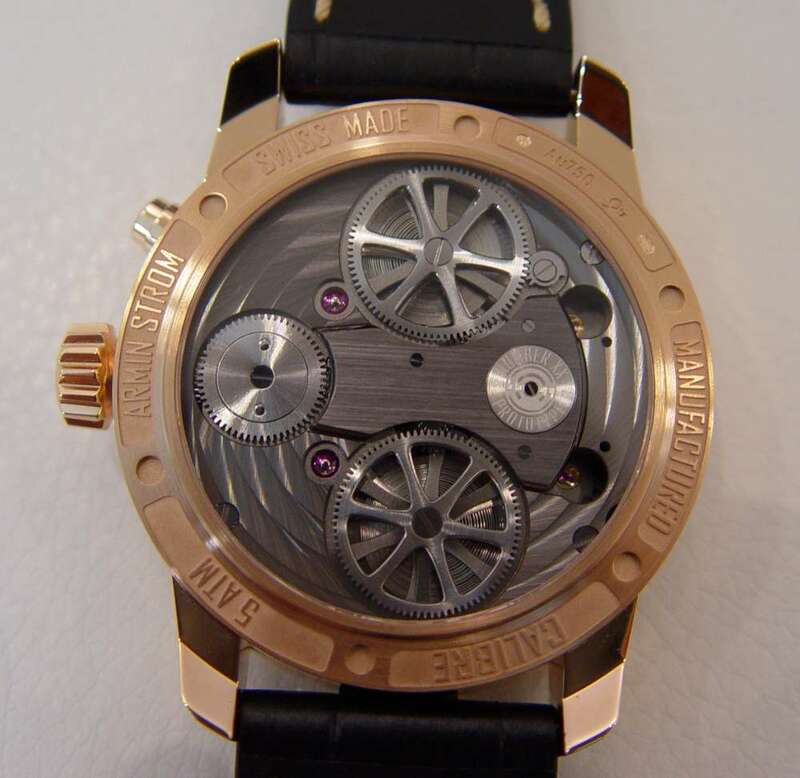 More at the Armin Strom website. This watch is based on an antique model by the brand, originally founded in Denmark and now operating from Switzerland. The Alfred has the characteristic Jürgensen features, such as the hand-crafted hands, the grenage textured dial surface, numerals that are not printed, but rather engraved and then hand-lacquered, the hallmark teardrop lugs, and an in-house movement. 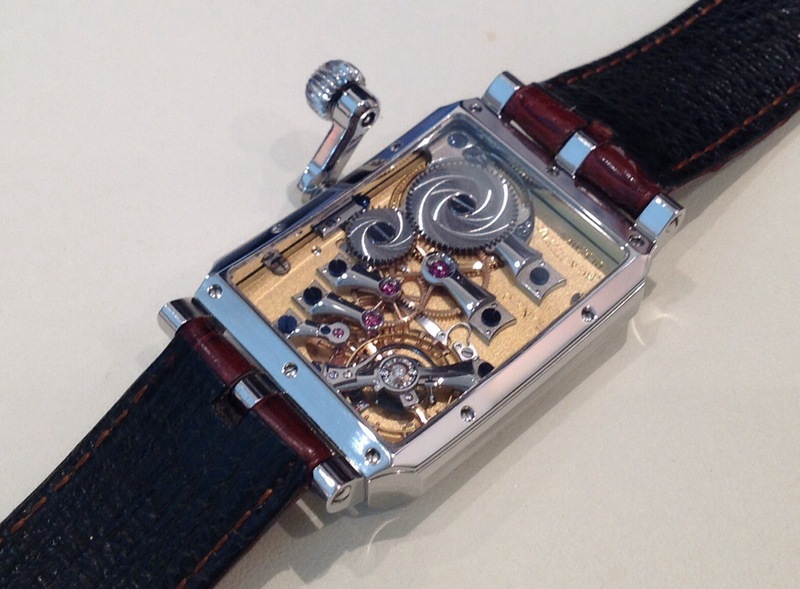 The P4 movement is hand-wound, runs at 21,600 vibrations per hour (3 Hertz), and provides a power reserve of 72 hours. It is a compact timepiece at 42 mm diameter, with an interesting caseband structure, and a charming period feel. Price €14,300 plus VAT. 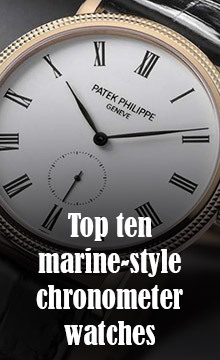 More attractive considering that the brand only makes around 500 watches per year. 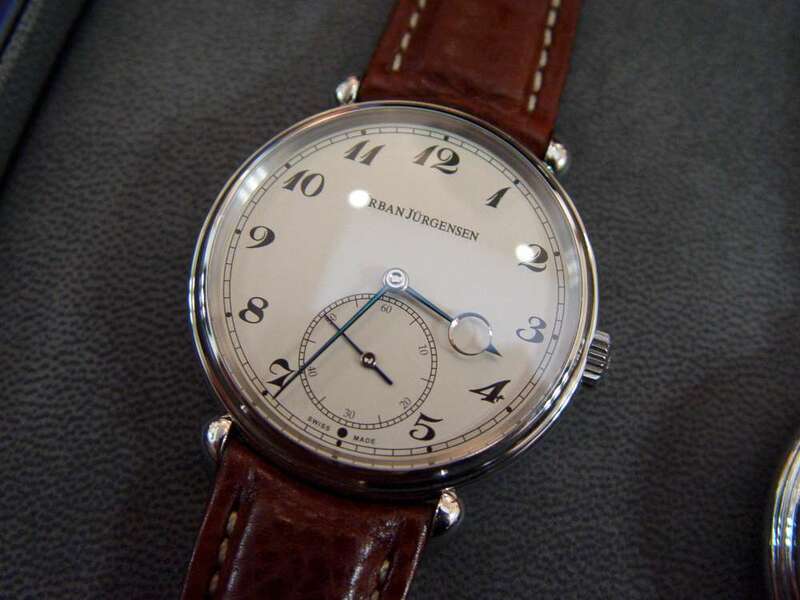 More from the Urban Jürgensen website. It has been said that for men, a watch is a car that you can wear on your wrist. So it’s not surprising that there are many examples of watches directly inspired by cars. The Louis Erard Ultima Limited Edition is based on the like-named £200,000 supercar, made by the British manufacturer Ultima located in Hinckley, Leicestershire. 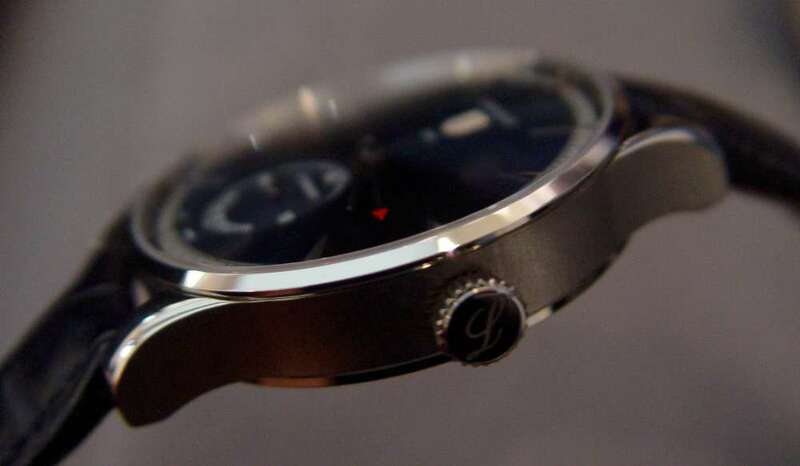 It has a carbon-fibre dial, and a subdial for continuous seconds with gold finish. It mirrors the instruments on the car’s dashboard. This is a 100-piece limited edition, available from now, November 2017, price £1,295. Another limited-edition chronograph has already sold out, and a third edition is available only for purchasers of the car. 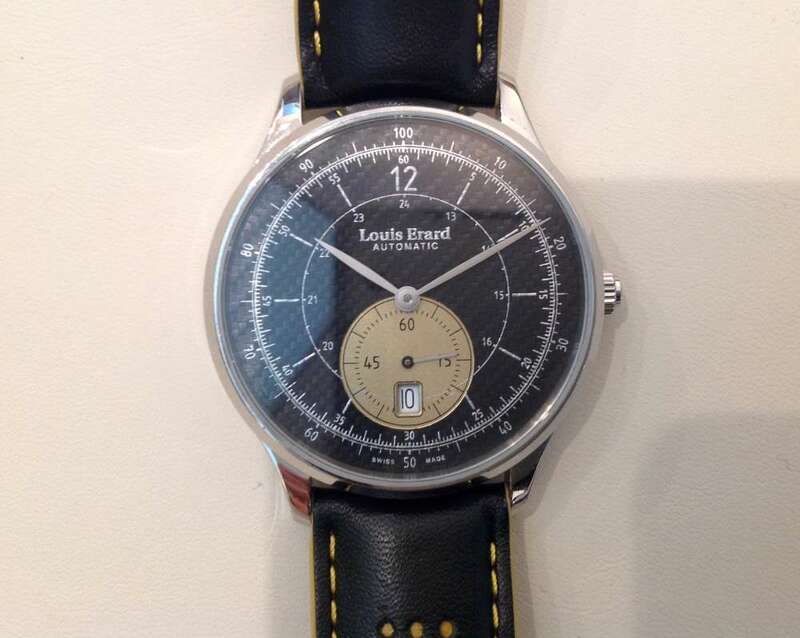 Read more on the Louis Erard website. Lonville is a fairly new brand, started by Dutchman Joost Vreeswijk, who revived a Swiss brand with a history running back to 1873 but that became a sleeping brand in the 1950s. 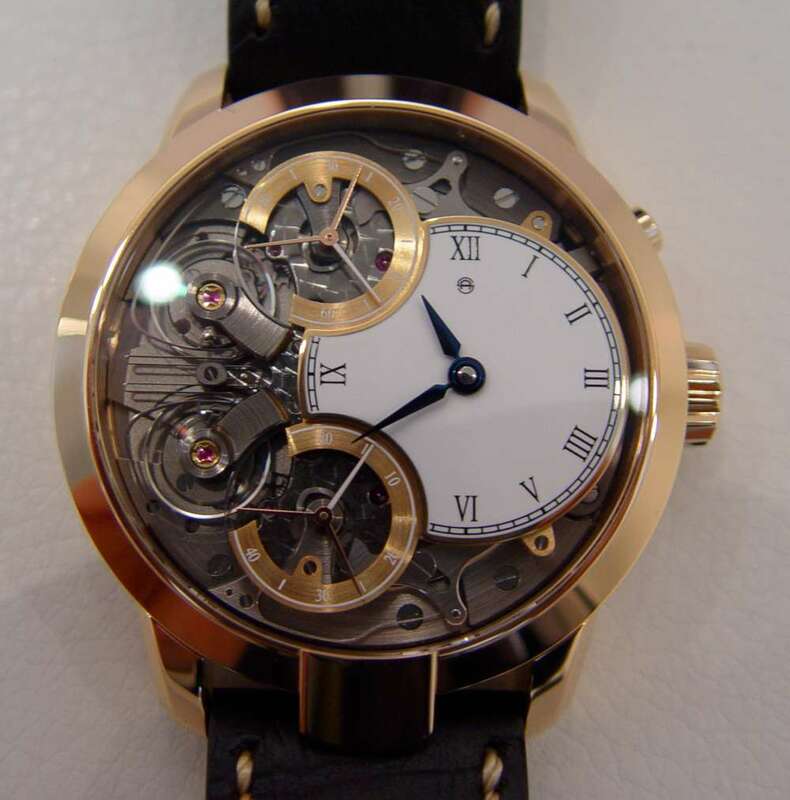 His new watches are interesting for their very limited edition numbers, and the movements, made by a small company in La Chaux-de-Fonds that had recently begun making their own calibres. 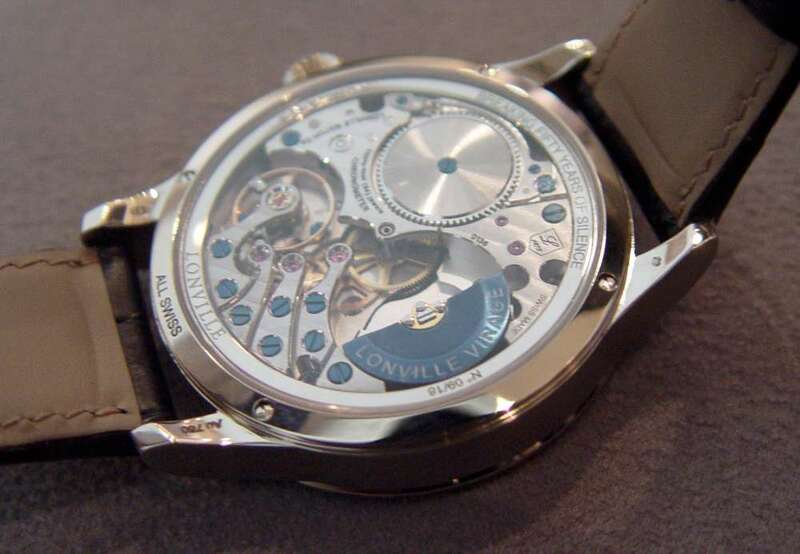 The LV1 movement used in Lonville’s first watches has a micro-rotor with blued finish. It is COSC chronometer-certified, and finely decorated. The Virage 59 Blue GMT with small seconds and GMT has a deep blue sunray dial, and a 40-millimetre case in white gold. The movement is COSC-certified and has an 80-hour power reserve. At the base of the dial and on the caseback is the motto “All Swiss,” because the watch is genuinely all Swiss-made, in contrast to the figure of 60% Swiss which is enough to be able to mark the dial “Swiss Made.” The same sort of policy was amusingly adopted by H. Moser with their “Swiss Mad” watches. Price 19,900 Swiss francs, £18,900. More from the Lonville website. At Salon QP Lang & Heyne displayed (amongst other products) this piece, the Georg watch modified with an unusual interpretation of the crown. It is a bespoke piece made for a customer who has difficulties with normal crowns, and so they engineered this new pattern that combines the conventional crown with a crank. When it is not in use, the crank lies horizontal and the crown is screwed into a threaded recess on the caseband. 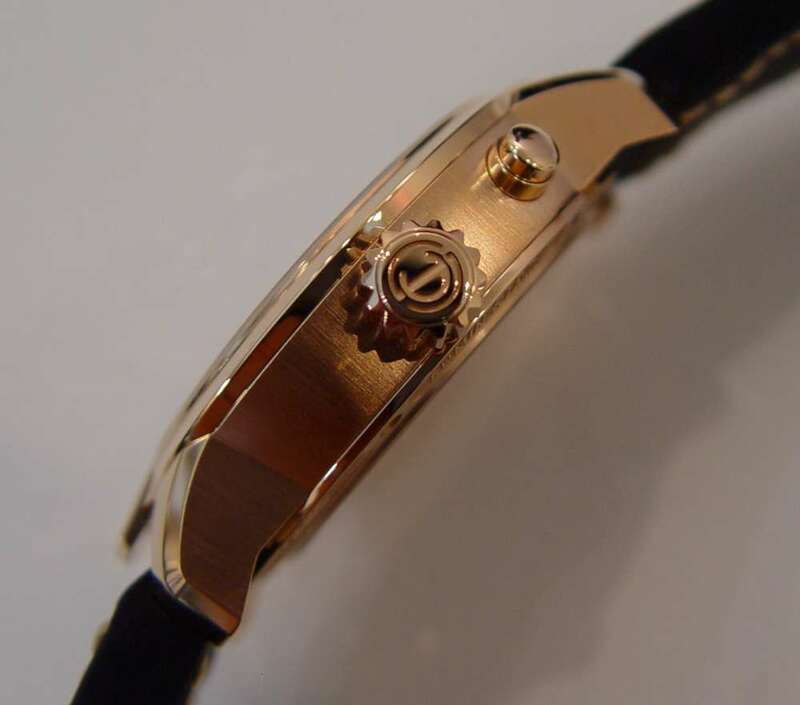 When you want to use the crown, you just unscrew it from its resting position, and then you can wind the watch or set the time, crank-handle style. The normal Lang & Heyne Georg costs about €28,000 in white gold. They didn’t tell me how much this bespoke piece cost, “a small increase.” It’s an example of what is becoming a progressively more important theme in watchmaking, the attraction of niche brands who have no problem about customizing their watches to create a unique product. 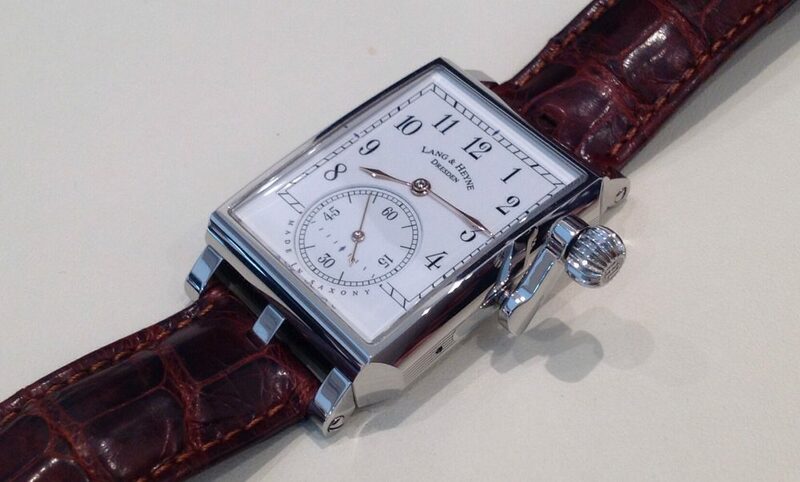 More on the Lang & Heyne website. Fugue is a new French watch brand founded by Leopoldo Celi. The piece that he showed at Salon QP is distinctive for having an interchangeable case. Each watch is supplied with a steel case, plus an alternative, a gold-toned case and a black version, possibly PVD. 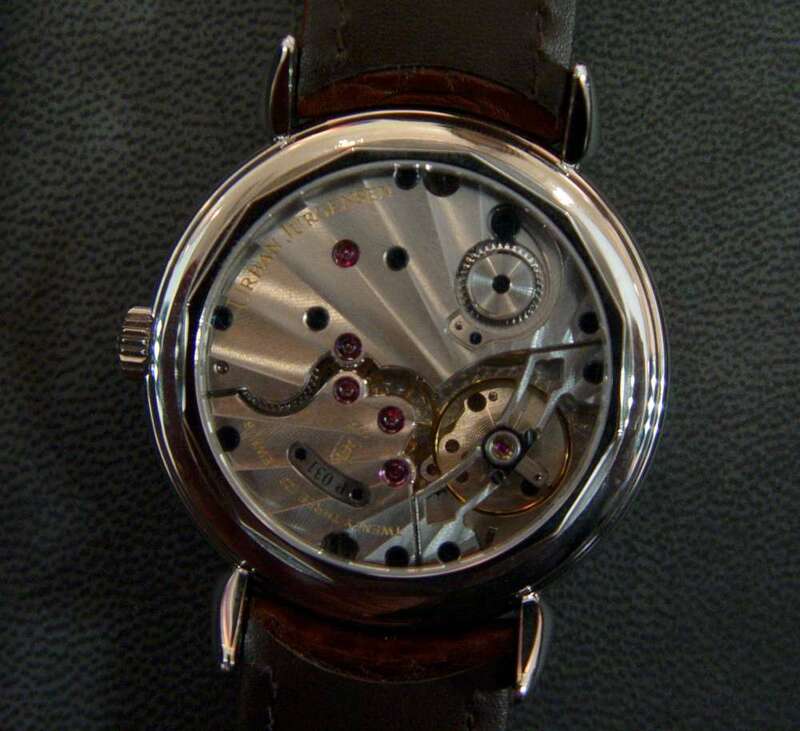 The inner section of the watch has a series of small ball bearings on the side which clip into recesses on the external part of the case, which is continuous with the lugs. The strap – two are supplied with each watch – simply loops through the lug bars like a NATO strap, but it has a thinner central section so that even if you hold the watch vertically from the buckle, there is no risk of the watch itself slipping off the strap. The watch itself is a conventional three-hand timepiece with a distinctive dial design. It is powered by the Ronda R150 Mecano automatic movement, which runs at 28,800 vibrations per hour, has the stop-seconds function, and provides a power reserve of 40 hours. The watch is made in batches of 300, all individually numbered. You can choose your preferred number if you wish. The price of the watch, complete with two external case units and two straps, is £1,050. Read more here.